Join ringers from around Area 5 for a weekend of handbell music, education, fellowship and fun! Please read below for more detailed information for our event in Dayton, including the repertoire list. The 2019 Dayton Festival is in the books! We hope all our attendees had a wonderful time and made it home safe. Please take a moment and fill out the Feedback Survey. The Area 5 Board would like to know your thoughts as we plan future events. Thank you! 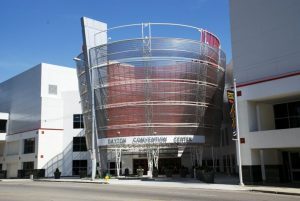 The convention center is located directly across the street from the host hotel, connected by a covered walkway. The hotel and convention center share a parking garage. We strongly encourage registrants to use the room block in our host hotel. 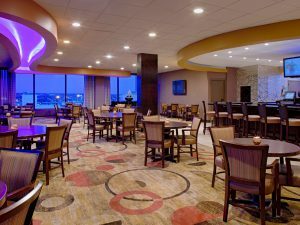 We have negotiated a special rate for you, and it is located directly across the street from the convention center, connected by a covered walkway. The hotel and convention center share a parking garage. The special event rate for the Spring Festival is $121 plus taxes per night. Please use this link when booking: Handbell Musicians of America. Once you fill in your check in and check out dates the agreed upon rate will populate. From there you will be asked to provide your contact and payment information, and you will receive a confirmation number at the time of the booking. Cut off date for special rate: Tuesday, February 26, 2019. *NOTE: The hand chimes used list for Sacred Silence is inaccurate; it does not include the required bass clef chimes. Also, if you don’t have the 4th octave of chimes please play those notes on handbells (G3, A3, B3). 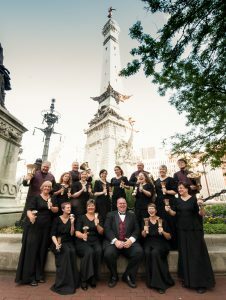 The Circle City Ringers is an auditioned, community-based handbell ensemble from the greater Indianapolis area. Under the direction of Mike Keller, this ensemble performs year-round for many different kinds of events, including church services, weddings, civic events, private parties, festivals, and workshops. If you would like more information about Circle City Ringers, please visit us online at www.circlecityringers.org or Like us on Facebook. We also invite you to come up and meet us after our performance — we’d love to say hello to you! 1:00-4:30 PM Registration. Equipment may be delivered and set up. This track has been cancelled. See below for more details. Step 1: Please pre-register for this class by sending a message to Denise Holmes at chair.area5@handbellmusicians.org so we have a count of attendees. Step 2: Pre-registration via the Handbell Musicians of America website required. From the HMA website, hover over “Music and Resources” to see the expanded menu, and then click on “Handbell Musician Certification”. Click on “Handbell Techniques” to see an overview of the class; we will be offering Handbell Techniques 1 at this festival. Return to the Certification page and click “Enroll” to register. Meeting times for this track are Saturday 9:15-11:30 am and 1:00-3:15 pm (with breaks). Attendance is required at all sessions. Minimum of 6 registrants needed, with space for up to 10. You will learn how to re-wrap your yarn mallets so they look less like a muppet and more like a mallet. You must bring the mallet you want to mend to class. There will be a $5 charge to cover materials, collected at the door. This class will be offered for both Tins and for Coppers. Please pre-register by sending the name of each planned attendee and their division (Tins or Coppers) to Denise Holmes at chair.area5@handbellmusicians.org. The Bronze Track in has been cancelled; we did not have enough applicants to fill an ensemble. We will, however, offer a Bronze Repertoire reading session with Joe Galyon as a substitute class. Pre-registration is not required. Here is your chance to try out Bronze Repertoire without the pressure of a performance at the end of the festival. Lee J. Afdahl is the Director of Music and Organist of First Presbyterian Church of Rochester, Minnesota, a position he has held since 1991. A graduate of Luther College, Decorah, IA, Lee is a church musician with forty years of experience in leading active programs of choral and handbell ensembles in Michigan and Minnesota. Currently he and his part time music assistant are responsible for leading four vocal and three handbell choirs, an elementary instrumental program, a church orchestra, and he advises the church’s annual concert series. Lee Afdahl is frequently a conductor and clinician for handbell conferences, choral workshops, and church music conferences internationally. He has conducted festival conferences for the Handbell Musicians of America at the local, area, and national levels, for handbell classes of American Guild of Organists, Fellowship of United Methodists, Presbyterian Association of Musicians, and international handbell events in England, Japan, South Korea, and Australia. Mr. Afdahl has served the Handbell Musicians of America as Michigan Chair for Area 5, Chair of Area 7, and is a Past President of the national board of the organization. He represented the organization as a conductor at the International Handbell Symposia in Adelaide, Australia in 1994, Liverpool, UK in 2012 and Jeju, South Korea in 2014. 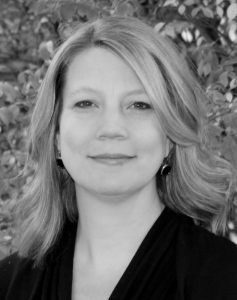 Lee has taught intermediate and advanced conducting for HMA Seminars, and currently teaches conducting for certification for HMA. Lee is an active organ recitalist and published composer and arranger of handbell, instrumental, and choral music with over seventy compositions and arrangements in print. Patty Saunders serves as the Music Director for the Alluring Community Handbell Ensemble of Lexington, Kentucky. In addition to planning and rehearsing this auditioned ensemble, Patty directs a children’s handbell choir, the Music Makers, with children in grades 3 through 8. She has a strong desire to collaborate with local and regional artists and she has partnered with the Lexington Philharmonic, University of Kentucky’s Choral and Opera departments, as well as Asbury University. Previously, Patty directed the handbell choir at Tates Creek Presbyterian Church in Lexington. She has been involved with handbells for over 15 years and has studied conducting with Dr. William Payn, Dr. Ted Gentry and Dr. Shelly Boardman. She holds a B.S. in Biochemistry and a minor in Psychology from Virginia Tech. Patty is involved with Handbell Musicians of America, previously as the Kentucky State Chair, and now as the Education Chair for the 5 state area. She is working toward music education and grants for schools, churches and organizations where chimes and bells add benefit to existing programs. Patty has taught a variety of workshops and led repertoire reads at the local and regional levels with Area 5 as well as with the American Guild of Organists. Patty enjoys conducting massed rings as well as working with individual choirs as a private clinician. Her love for artistry and musicality is contagious as she promotes accurate technique and form within the art of handbell ringing. Are you a conductor interested in working with massed handbell ensembles? Please take a moment and consider our Associate Conductor Program. Our goal for this program is to identify, train, and nurture potential new conductors for massed ringing events throughout Area 5. Our 2017 Associate Conductor, Brenda E. Austin said that the program was “an incredible experience“.